Weighty Matters: Resolution Series Day 10: Look at Pricetags! Day 10: Look at Pricetags! 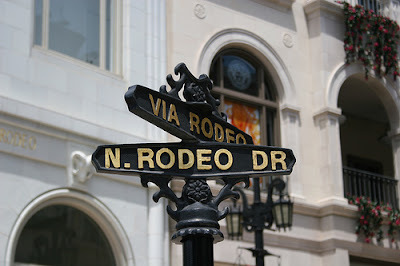 So let's say you wanted to buy a new outfit and that you decided to shop on Beverly Hills' Rodeo Drive. If you didn't look at price tags before you bought your clothes, do you think you'd be pleasantly surprised when you got that month's Visa bill? Weight wise, the currency of weight is calories, and unfortunately the world out there? It's the Rodeo Drive of calories, where foods that don't look like much, or foods that are "healthy", may still have stupidly high, non-intuitive caloric prices. I'm not saying calories are the be all and end all of nutrition, but they're certainly a nutritional determinant of health. Research regularly and conclusively points at calorie reduction as life extending, and therefore even if weight's not your concern, a reduction in your total calorie consumption may be beneficial. Thankfully nowadays calories are easy to identify. Whether by means of nutrition facts panels, online resources, or in some States, even posted on menu boards. So this year, resolve to look at price tags, with the question to be asking yourself, "Is it worth the calories", and where sometimes, even if they're exceedingly high, the answer's going to be "YES!". Calories are but one branch of your decision making tree, where other branches might include your stress level, religious holidays, how long it's been since you've indulged in it, how good or bad your day might have been, what your calories have looked like lately, etc. But they do make a difference. For instance, I've never met a muffin worth its calories, and once you start looking at price tags, you might feel the same.